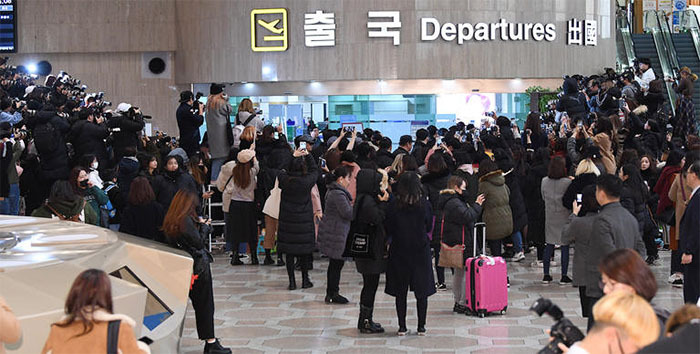 Three obsessive K-pop fans in Hong Kong caused a Korean Air flight to Incheon to take off an hour late on Saturday when 360 passengers were forced to disembark and go through another security check. Two mainland Chinese and one Hong Kong passenger on board suddenly told flight crew that they wanted to get off the plane. It later turned out that they had only bought their first-class, business-class and economy-class tickets to get close to Korean boy band Wanna One, who were on the plane. Once they had got a closer look at their idols they had no intention of flying all the way to Korea and wanted to go home. Fans watch boy band Wanna One leave Gimpo International Airport in Seoul on Dec. 11, a day ahead of their concert in Japan. Under aviation rules, all passengers of a flight must undergo another safety check if even one passenger gets off to prevent the disembarking passenger planting a bomb on board. A Korean Air staffer said, "We told the three passengers not to disembark, but it was no use." 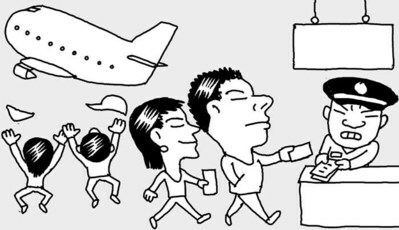 Incidents diehard fans buy plane tickets just to follow their idols into the departure area are getting increasingly common. They often buy first-class tickets because they entail a full or almost full refund for missed flights. Many are a new breed of social-media paparazzi who sell or otherwise monetize their close-ups of the stars. Incheon International Airport is notorious for such incidents, and Korea, unlike Singapore, has no laws that make it an arrestable offense to enter the departure area without the intention of flying. Many fans follow their idols past the security checks and cause a nuisance with their screaming and snapping, but airport officials say they are stumped as to how to stop them.